Joe Hart is settling into life at Torino well. 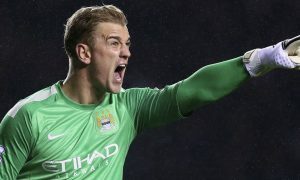 After a shaky debut, in which he committed an error leading to a goal, England’s number one went on to keep successive clean sheets in 0-0 draws, and today starred in a momentous 3-1 win over Roma, where Joe faced former City team-mate Edin Džeko. Hart is quickly becoming a fan favourite with the passionate Torino fans. Today they unveiled an 1894 Group flag that the 29-year-old seemed to appreciate. The goalkeeper is on a season-long loan at the Stadio Olimpico Grande Torino, with his new side currently in 10th place after six rounds of matches. His long-term future will be decided next summer, with some big clubs likely to be interested in purchasing him from City.